Peanut butter Oreo popsicles are going to become your new favorite frozen treat. Trust me on this! I’m sure I have burnt you out on popsicle recipes this summer, but pity me for I am ice cream maker-less. Not that I can really complain, because I don’t have a vast amount of space in the freezer for one anyway. But the chimes have rung out in my mind and I am scurrying to get up all the summer fun posts I have been squirreling away before the leaves change color. It was like a silent alarm went off in my head this weekend as I started contemplating holiday gifts. There are no birthdays or real celebrations from mid-September until December in our family. Everyone is either a product of cold winters or has their birthday stifled by other family holidays. Which means that from August 17th on, it’s full on holiday shopping mode for me. No, I wont be the person picking out my holiday ornaments before I hand out the last of last year’s candy to the kids at Halloween. But I can start to plot. To stir up my ideas of grandeur, the most awesomest of awesome gifts, the tastiest party, the stocking stuffers and so on. I am like a freakin ninja squirrel of holiday presents, stocking up and storing for that special day. Sure, there are apples to be picked, pumpkins to be haunted, and turkeys to be carved, but from here on out, somewhere in the back of my head, the Christmas bells are ringing. I hope that song is just as stuck in your head as it is mine right now. There’s no undoing that one. Sorry. But at least it has you thinking of cold things, like popsicles! 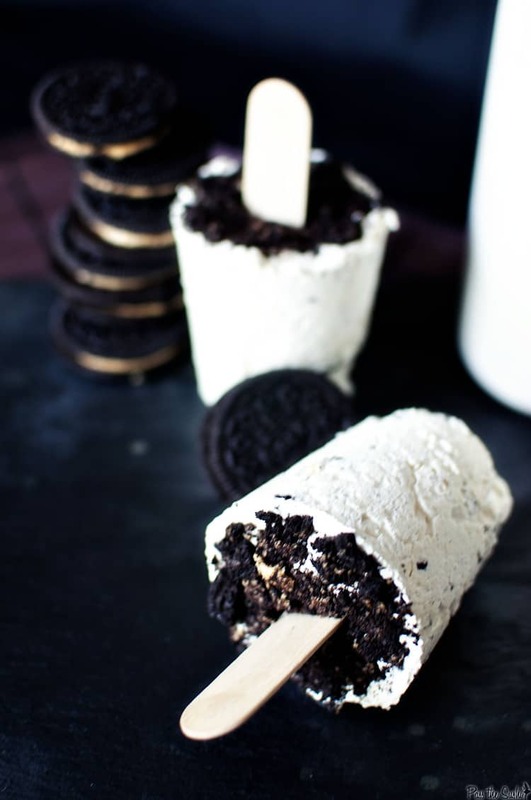 Peanut butter Oreo popsicles, if you please. In a ziplock bag, whack the cookies around a bit so that they are broken into large chunks. I like to use a rolling pin and let out some frustrations. Don’t go haywire though, you don’t want crumbs, yet. In another bag with remaining Oreo’s, beat the living day lights out of things for a fine cookie crumbly topping. In a large bowl, whip cream cheese until light and fluffy. Fold in the whipped cream and cookie chunks. Pour mixture into popsicle molds or wax lined disposable cups. Gently pat down to make sure all air bubbles are filled in. Insert your wooded craft sticks and sprinkle cookie crumbs on top, pressing gently with your fingers. Remove pops from molds and enjoy. To make this dessert “healthy”, you could use light whipped cream and low fat cream cheese. To be fair, Handsome’s b-day is around the holidays. And so are several other awesome peoples, so it’s not all Christmas planning. If you are not a fan of the holidays, don’t worry. Pass the Sushi will remain seasonal and fat kid friendly long before it becomes like the shelves of your local art store after the 4th of July. Holiday gifts? Say it ain’t so! These popsicles are reasons to celebrate any day. Great idea. i love the peanut butter Oreo cookies. I especially like the whacking and beating up cookies part. I’ll bet they taste great! Oh my. I have never wanted a popsicle as much as I want one of these. Amazing! Whoa. These are outstanding. My inner fat kid just knocked down my inner health nut and skinned her knees to smoosh his face against the screen. Well done and totally buzzed. Speaking of Halloween…any ideas? We went as Paul Bunyan & Babe last year. Those look delish– excellent idea. Don’t worry, you’re not alone– I too am ice cream maker-less! Oh my word I am in love with these. But I cannot find peanut butter oreos anywhere! It’s heart-breaking. Why are fun food items so difficult to hunt down where I live?? I have never seen peanut butter oreos, obviously I am missing out. These popsicles look awesome and with so little ingredients-well done! These look so awesome!! Never seen someone use cream cheese in a popsicle, but I have no doubt they are delicious! Holy Crap Woman!! These are like pure heaven! Yum!! These look absolutely delicious – especially for those warm summer nights! these pictures are gorgeous and they look SO good!! I’ve been loviing all your popsicles. Such great flavours, this one included! I’m in love with this recipe. OH WOW! I’m speechless! My daughter is going to want for you to adopt her after she sees this!! These look so good! I didn’t even realize there was such a thing as PB Oreos! Love all your popsicles but these are my favorite!! Great idea, once again, Kita! 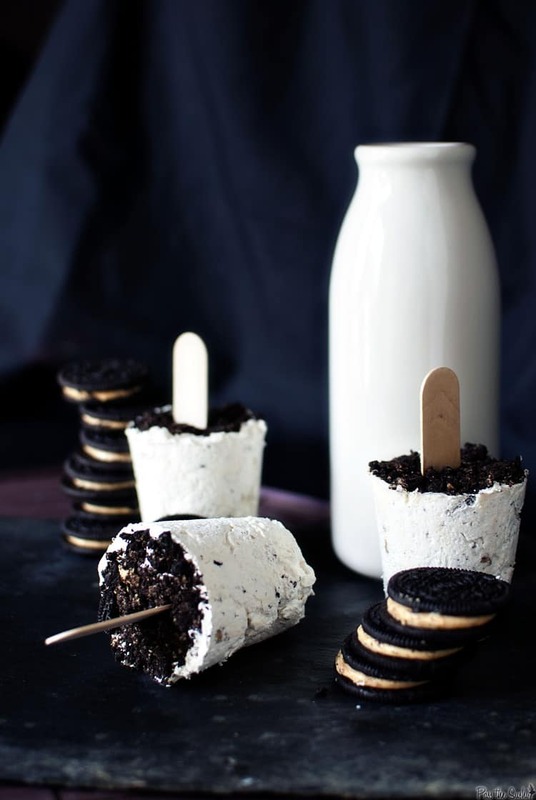 I love adding Oreos to my ice cream so I’m sure these would quickly become a favorite too! I’m sure I’ll be indulging in them soon enough! Haha! Dang! These are so amazing. Cookies and Cream ice cream is one of my favs, so these popsicles are really singin’ my tune. Okay…where should I start? I know…how ’bout…..YUM! 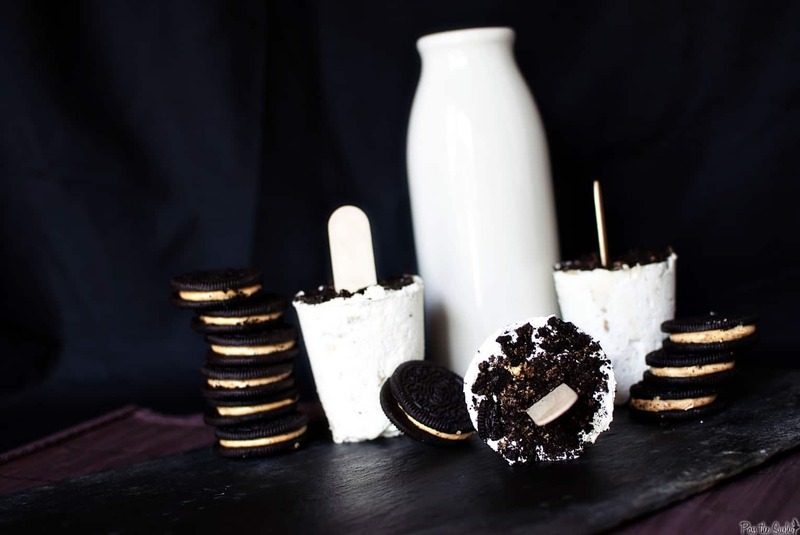 They look amazing and peanut butter and oreos is a brilliant combination! I love the pictures and the milk bottle. I also have to say – your recipe reads like a conversation with a friend….just lovely! Buzzed this with high hopes for Top9! Interesting recipe, again more cream cheese, and an amazing photo. How FUN!! These look so cool! I love when leftovers recycle into something wonderful like this! Wow!! An amazing looking dish. I can’t wait to make it!! Congrats on getting Top9!! They’re gorgeous! Love the black and whiteness of it without actually being a B&W photo! What a great idea! They look easy enough and so pretty too! I’d like to be munching on one of these right about now and its only 10am! Hey, this is looking super cool, lovely idea and a great snack to munch anytime. Horray for popsicles and you too…..!!! Amazing! Congrats on Top 9! You crack me up Kita, Congratulations on Top 9! What a wonderful idea! My boys would love this. Seriously, a recipe like this is instant omnipotent power in our household. They’d do almost anything for such a perfect treat. Well done. Grats! Oh girl, this looks like it could be my undoing! Kita so beautiful!! Handsome was happy I bet!! haha. BTW I liked your post over at Diethood today. You did great achieving the Kate look! I made these to entertain ourselves while we were waiting out Irene in NYC this weekend. They were amazing! I used fat free Cool Whip and 1/3 fat cream cheese and regular Oreos (I wish I could have found PB ones!) and it was still delicious. Just like cookies and cream cheesecake! Hi Kita, I first saw your food picture on FoodBuzz and was immediately drawn to the black and white composition of the photo. After seeing your recipe, I have to say I am truly impressed! These are the most elegant popsicles I have ever seen, reminds me of Coco Chanel! It is such an original recipe and perfect for the (end of) summer. Thank you for sharing! I love this post…it made me laugh! These popsicles look awesome, thanks for sharing! how many popsicles does this recipe yield? yum! 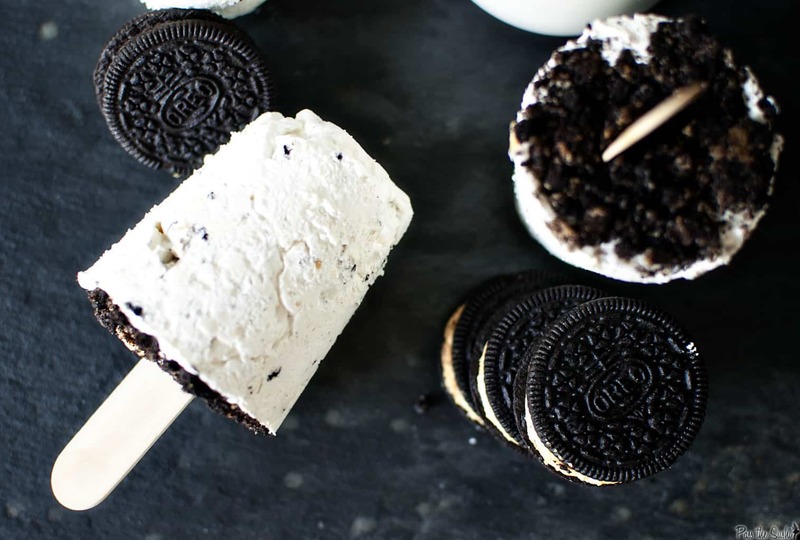 I’m craving cookies and cream ice cream this weekend, these look amazing! Omg are you kidding me? These are to die for! And best of all, I just got a popsicle mold today! I’m really confused by the “1 container whipped cream (not the kind in the squirty jar), thawed” ingredient. Do you mean frozen whipped topping, like cool whip? I assume this is what you mean, because whipping cream isn’t usually sold frozen. But I have never heard whipped topping / Cool Whip referred to as whipped cream. Yep, cool whip is what I was meaning on that one. Whew, I need to go back and re-read this recipe ;D It’s been a while. Can I whip up some heavy whipping cream? I don’t have any cold whip. I would certainly give it a go. i think CoolWhip tends to be a lot lighter than traditional whipped cream, which makes for a less dense pop – but I think with enough air in your whipped cream, these could be killer with the real thing!